Here we are, a year after the launch of G80, and we are seeing what amounts to the first real "refresh" part. Normally, we see a new or revamped version of hardware about 6 months after its introduction, but this time NVIDIA introduced its latest architecture over a six month period instead. First we saw the high end hardware hit, then the low end parts emerged after resting on previous generation hardware to serve as the low end. We haven't seen a true midrange part come out over the past year, which has disappointed many. Rather than actually create a midrange part based on G80, NVIDIA opted to tweak the core, shrink to a 65nm process, integrate the display engine, and come out with hardware that performed somewhere between the high end 8800 GTS and GTX (G92). While this, in itself, isn't remarkable, the fact that NVIDIA is pricing this card between $200 and $250 is. Essentially, we've been given a revised high end part at midrange prices. The resulting card, the 8800 GT, essentially cannibalizes a large chunk of NVIDIA's own DX10 class hardware lineup. Needless to say, it also further puts AMD's 2900 XT to shame. We will certainly provide data to back up all these ridiculous claims (I actually think NVIDIA may have invented the question mark as well), but until then, let's check out what we are working with. We've got a lot to cover, so let's get right to it. Just ordered mine Friday, should be here Wednesday. I was lucky, ordered it from Newegg at $239.99 and it seems totally worth it after reading these comments. geforce 8800 gt: the only card that crashes my PC in nv4_disp over and over and over. no matter whose 8800 I use. It'd be awfully nice to have the axes of the graphs labeled. For the first set, I can guess that they are screen resolution on the horizontal axis, and frames per second on the vertical, but I could be wrong, since there's no labels. I also couldn't follow the page on comparing the 8800 GT to the 8800 GTX. Your conclusion seems to state that, "the 8800 GT doesn't touch the GTX." However, I can't come up with that conclusion from the graphs. They look roughly comparable in most of the tests that you've shown, with only a slight advantage to the GTX at very high resolutions. On the "Out with the old..." page, there is a typo in the second paragraph. In the last sentence, "fasted" should be "fastest". From what I have read here and else where this seems to be THE card to get. Before I make a purchase though, I would very much like to see more data comparing the cards offered by the different card manufacturers. O.M.G - it really is amazing. I bought 2x 7800GTX's (just before the 7900GTX's came out) at £660 for the pair and this card just blows them away. On my 24" dell monitor at 1920x1200 with 4xAA on an opteron 175 @ stock 2.2ghz i get average 125fps in Team Fortress 2. Everything else I've tried has been very smooth - world in conflict, bf2142. A *very* noticable performance increase at a billiant price! If you're considering an upgrade buy one of these NOW, play todays games at awesome speeds. then get a nice new intel 45nm quadcore + x38 + ddr3 in january when the products are released and prices will be lower.. Then if needed sell the gfx card and buy whatever nvidia are offering in january - if you really need too (which i doubt you will). First, our understanding is that the RV670 based AMD part will not be any faster than the 2900 XT (and will likely be at least a little bit slower). Most online retailers have pulled these items off their websites entirely, as I'm sure these cards have been picked up ravenously by gamers wanting The Holy Grail of video cards, as it seems this is. My question is, "Why so cheap, and why now?" for injection into the market, NVIDIA could have raised the price at least $50 (which most retail shops have already done to capitalize on its popularity) and still have a product that sells like crazy. This makes me wonder what is next, and if a better product is in the works that makes them want to get rid of this inventory as quickly as possible before the next big thing comes out. 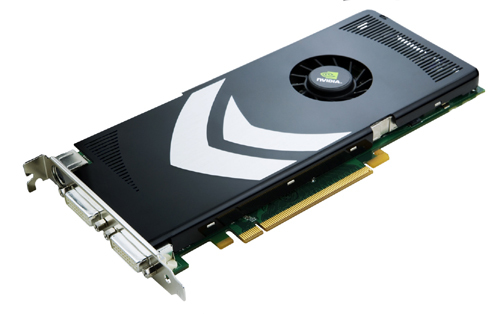 It may be (and yes, I'm reaching) that this card is on the low side in NVIDIA's new product line, and they can clear inventory at a price premium now as opposed to when the full line is released. They have little reason to throw out their best until AMD has shown their hand, and are playing the same game that Intel is, with their 3.0ghz processor that can easily be clocked higher.